PDF files can be real jerks. Get a lemon and you're stuck. 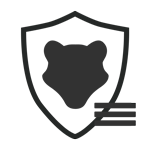 Don't be taken hostage by bad content, keep your snout clean and let Badger do the talking. Badger: PDF Negotiator. Only on iOS. 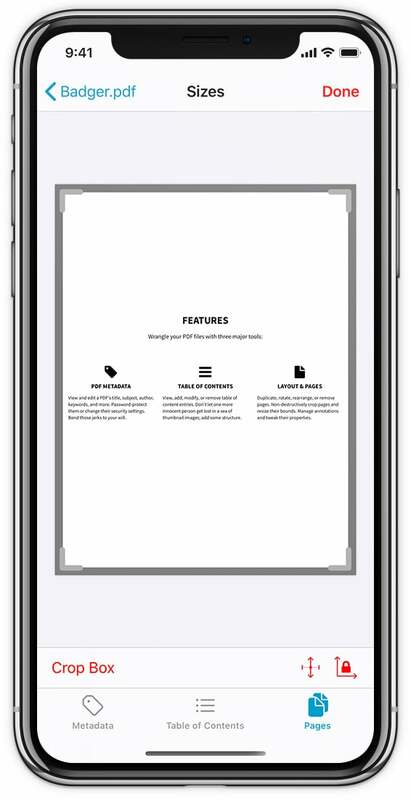 View and edit a PDF's title, subject, author, keywords, and more. Password-protect them or change their security settings. Bend those jerks to your will. View, add, modify, or remove table of content entries. Don't let one more innocent person get lost in a sea of thumbnail images; add some structure. Duplicate, rotate, rearrange, or remove pages. Non-destructively crop pages and resize their bounds. Manage annotations and tweak their properties. 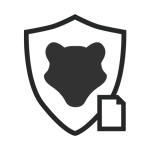 Badger works with your PDF files, wherever they're stored. 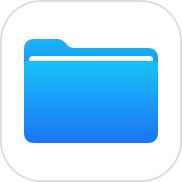 Use the Files app to browse through all of the documents stored within apps on your device, in iCloud, or through third-party file provider apps like Dropbox and Google Drive. Or, open your favorite app and find your content there instead. 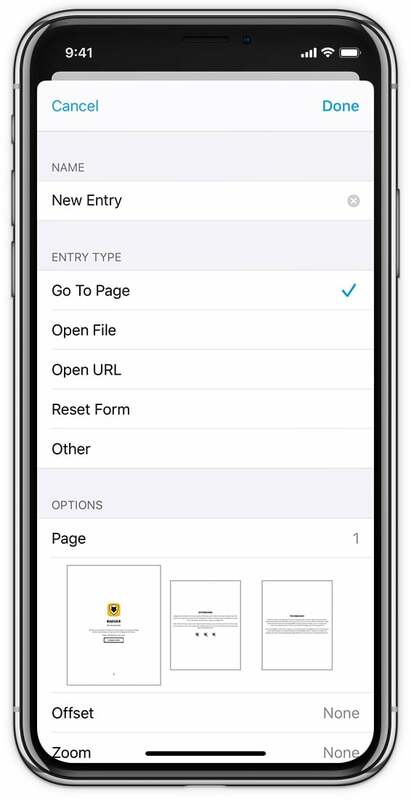 Use iOS' standard sharing functions to open the file with Badger. Edit the file, if needed, and when you're done you can save your changes back to the file's original location. No copying files back and forth, just true in-place editing of all of your PDF files, no matter where they're stored. 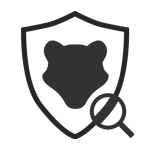 Badger can also store its own copies of files in its Documents directory, which you can access through the Files app or iTunes' file sharing panel. When you send files to Badger from apps that don't support in-place editing, like the Safari app, your PDFs are automatically copied here. Badger comes with three (3!) action extensions that let you use its features from within another app. 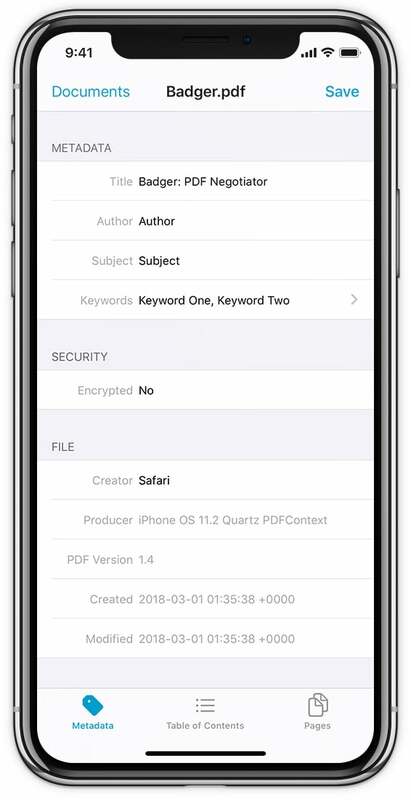 They work with any app that can share PDF files using Apple's standard sharing functions, allowing you to quickly view a PDF's info without having to send a copy over to Badger first. With a little bit of work, apps can also support in-place editing with extensions so you can load up your file in whatever app you're working in, make some changes with a Badger extension, and save those edits all without leaving the app or duplicating the file. PDFKit is the fancy name Apple gave to the set of tools they made so loads of apps could do similar PDF-related things without each writing their own version of the same code. 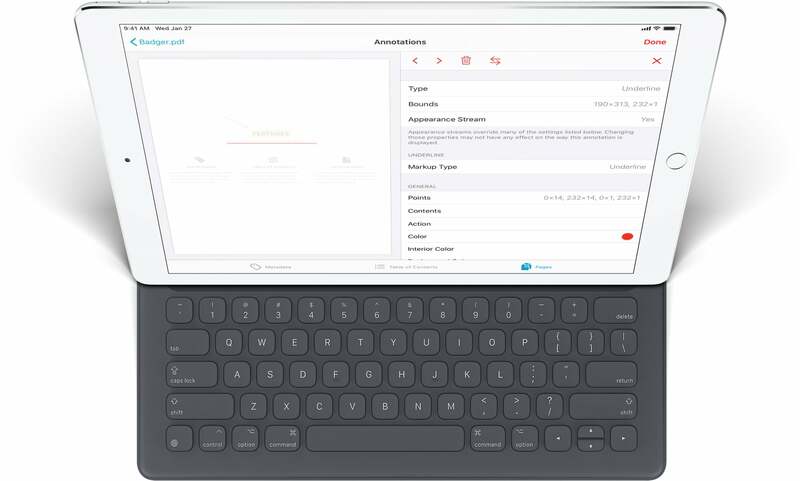 Their crack team of engineers already did all of that hard work, but even though PDFKit is already inside your iDevice, you can't actually use it (rude). That's where we come in. We put a face to that technology so you can do things with it. That means Badger is really small, as apps go, so it won't take up all of your gigabytes. And it means that all of those Apple engineers are constantly testing the code that Badger relies on, making it more stable and keeping it up to date. They read thousands of pages PDF specs so we don't have to, and we thank them for it. Badger is available now exclusively on the iOS App Store. It requires iOS 11.2 or newer and it runs on iPhones, iPads, and iPod Touches if those are still a thing. Need help? Have something to say? Contact us through our main app's website here and choose "Badger" from the dropdown list of apps so we know what the heck you're talking about. Badger is proudly made in Vancouver, Washington, USA.